Migration, voluntary or forced, is intensifying in the Mediterranean basin, inherently an area with a lot of traffic in terms of exchange and transit of people and goods. Faced with this situation, cities, offering a wide range of opportunities and services, are naturally attractive to people looking for a better and more secure future. UCLG is contributing to the City to City Migration Profiles and Dialogue Project, co-funded by the European Commission and in partnership with the International Center for Migratory Policy Development (ICMPD) and UN-Habitat, which will establish a tool, available to cities, to assist them in improving their understanding of the migratory phenomenon and the challenges being faced at a local level. UCLG is tasked with coordinating a network of 10 cities (five European and five from the southern Mediterranean). They are in constant contact with the political and technical officials of the cities around the Mediterranean and will offer them a range of services, expertise and exchanges to encourage an internal and external dialogue with the most relevant stakeholders leading to improved migration governance at a local level. The cities of Amman, Beirut, Lisbon, Lyon, Madrid, Tangier, Tunis and Turin have already confirmed their participation in this initiative. The participation of another European city and an Algerian city is also expected in the coming weeks. The first reconnaissance missions have already been conducted in Tangiers, Tunis, Beirut, Amman and Turin. Visits to Lisbon, Madrid and Lyon should take place shortly. Beyond the establishment of the network, the project partners have also started to examine the most relevant themes for the planned exchanges and project work. 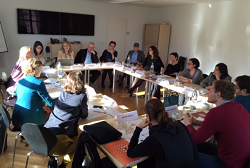 A meeting between the project partners and various academic experts was held on the 18 November 2015 at the ICMPD headquarters in Vienna. During the exchange different themes were identified as key areas to ensure better cohesion at a local level to deal with the current migration phenomenon: inter-cultural management, access to healthcare and education, access to housing, urban planning policies, human rights, co-development strategies and access to employment. A meeting of the operational focal points from the cities mentioned above is planned for early 2016 to discuss the themes and define the areas of work. This technical meeting will be followed by a political conference, which will allow the mayors of the cities concerned to talk about their actions on the ground and the needs of their cities (in terms of governance, resources and capabilities) to contribute to improved management of migration challenges at a local level.